Sassafras Root Bark is from a deciduous tree (Lauraceae family, native to the USA and the far east). Sassafras is Liver Cleansing, Male and Female Hormone Balancing, Gallbladder detoxifying and beneficial to the respiratory system. When consumed moderately, Sassafras Tea is very beneficial and when combined with natural sweeteners, is absolutely delicious. Although fairly unknown commercially Sassafras is still appreciated worldwide. When you make it you'll inhale a wonderful unique scent. Rare in the natural health world... it actually smells great, tastes much like Root Beer and has a gorgeous dark amber orange look. It's actually known also as Root Beer Tree because of its use in Root Beer, yes this Medicinal Tea is absolutely delicious. Sassafras (sassafras albidum in Latin) is also known as Ague Tree, Saloop, White Sassafras, Cinnamon Wood, Root Beer Tree (as mentioned before), Sarifrax or Smelling-stick. The trees can grow from 9.1 - 18 meters (30-59 feet) tall, spreading 7.6 to 12 meters (25-39 feet), with many slender branches. They possess 3 distinct leaf patterns, with smooth margins that grow 7-20 cm long by 5-10 cm broad. Tiny greenish-yellow flowers, with five petals, bloom in the spring and small egg-shaped fruit, 1cm long, produced on long red-stalked cups, reaches maturity in late summer. Sassafras Root tea contains safrole, tannins, mucilage, asarone and alpha-pinene. 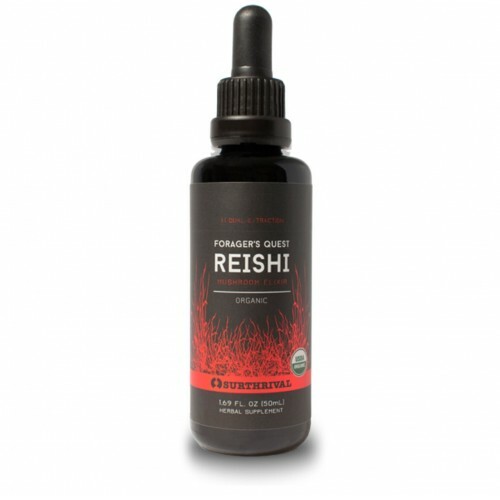 A combination that will provide you with several health benefits when taken in small amounts. Liver Cleansing: if you wish to maintain your liver healthy and normalise hormonal function, sassafras bark is your answer. It will offer you a liver cleanse, by stimulating the liver, balancing your hormones which in turn may prevent cramps during menstruation. Gallbladder: This tea will also clear congestion in the gallbladder and remove toxins from your body, so if you suffer from gout, rheumatism or arthritis, drink sassafras tea to ease your pain. 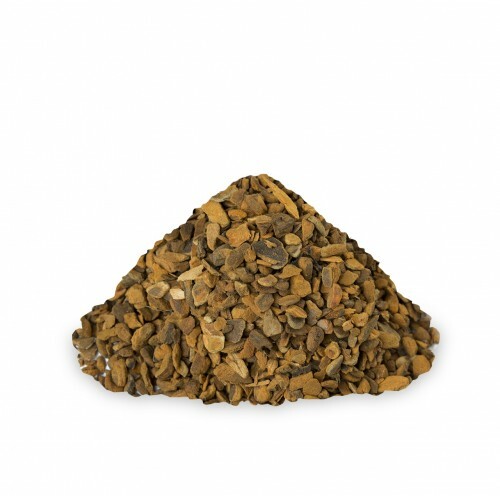 Male Hormone: Sassafras bark is also a great herb for enhancing flavour and healing properties of drinks for the male body, which can be used to deal with hormonal imbalances in men, the recovery of potency and vitality issues, liver congestion and the disruptions in the genitourinary system. Adrenal Health: A cup of sassafras root tea can also relieve adrenal stress, which exacerbates the symptoms in menopause. Blood Thinner: When drinking sassafras herbal tea in small quantities, it can be used as an anticoagulant and a blood purifier. Blood Pressure Support: If you suffer from high blood pressure, enjoy its diuretic properties as it eliminates toxins from the body, strengthening your immune system. Respiratory Health: Sassafras herbal tea comes in great hand to relieve those horrible symptoms of cold and flu, by treating fever, soothing cough and clearing stuffed nasal passages due to the spicy, numbing flavour of the sassafras oil in the plant’s root. 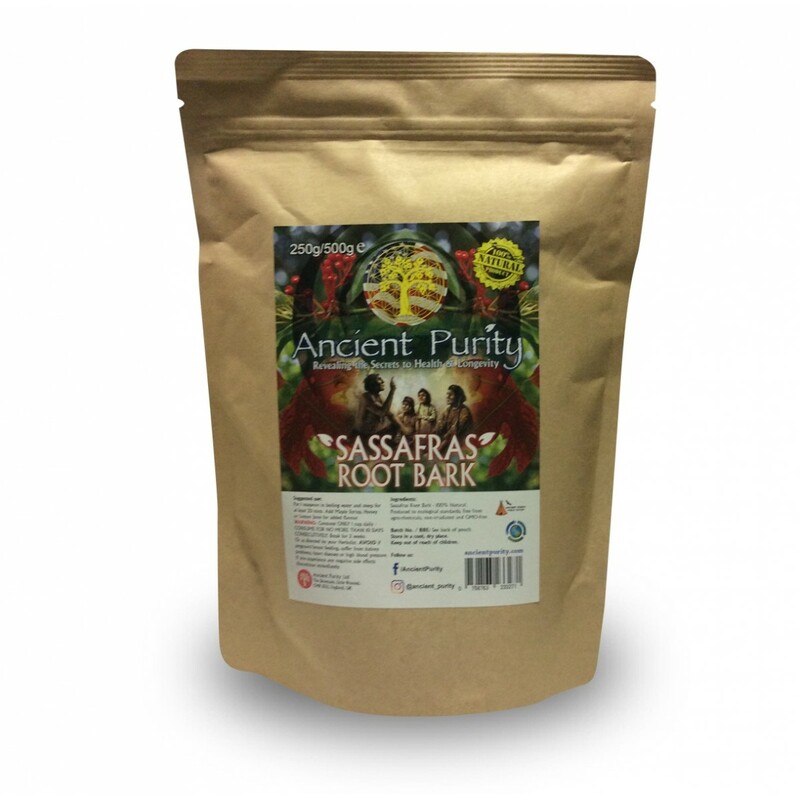 Consider making a fantastic Root Beer with Sassafras, you could add Chaga, Rehmannia, Stevia, Spring Water. Check out Root Beer recipes and use Sassafras as the amazing base. If you do drink alcohol, remember to drink some Sassafras Tea before bed, its Live Cleansing properties really help reduce the following morning's hangover. 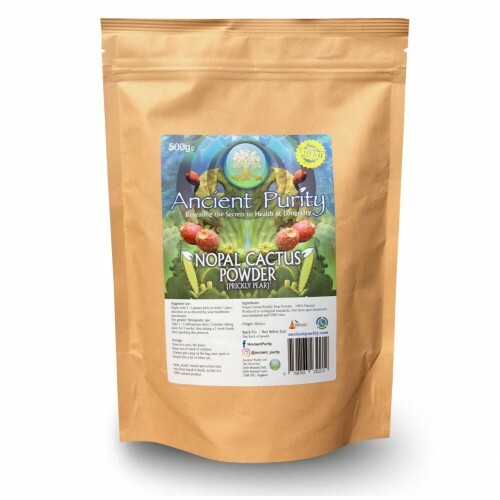 Add some Nopal Cactus Powder for fibre (if you can manage) and you should be feeling fresh the next day. Drinking it in small amounts will ease gastrointestinal issues, such as diarrhoea or constipation, by keeping your stomach hydrated and safe from harmful agents. Keep an eye on this cleansing tea if you tend to suffer from urinary infections or kidney problems. This medicinal tea is diuretic, able to calm down the urinary tract irritation and treat kidney ailments. Due to its antiseptic, antibacterial and astringent properties, sassafras tea can be used externally to treat skin irritation, eczemas and insect bites, by applying a soft rag on the area. It helps to heal wounds as well. It’s also a good alternative to treat sprains or muscle problems, as it relieves inflammation and eases the pain. The FDA has restricted the use of the herb based on the 1960’s study on rats. 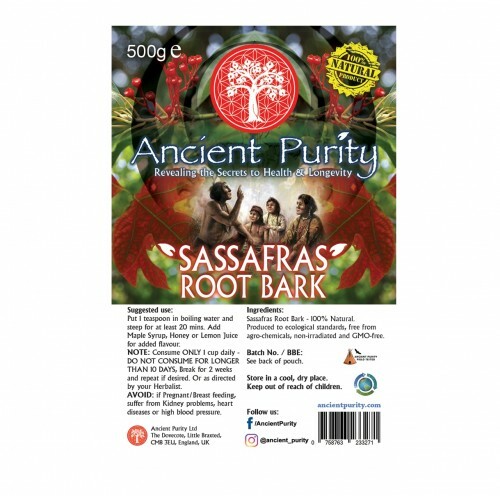 Therefore, only sassafras root extracts which do not contain safrole are still used commercially in teas and root bears. However, its safety is also questionable, so it’s up to you whether you drink it or not as there aren’t any proper human testing results so far. It has been estimated that one cup of strong sassafras tea could contain as much as 200mg of safrole, which is more than 4 times the minimal amount believed hazardous to humans. Consuming sassafras tea daily and in large doses may cause sweating, nervousness, liver damage, cancer, lethargy, incoordination, body temperature rise, breathing difficulty, skin inflammation, chest pain, itching, loss of mental balance, confusion, vomiting and allergic reactions. Most of these side effects are caused by the high amount its powerful active ingredients – safrole, tannin, asarone and mucilage, which is why you shouldn’t make this a daily habit. MODERATION IS ESSENTIAL! 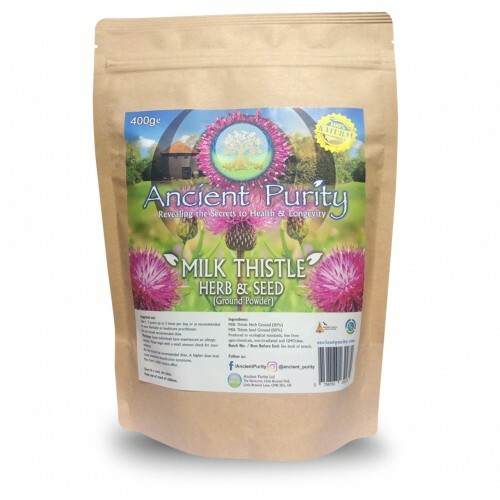 If you are pregnant or breastfeeding avoid all forms of this herb. It can promote uterine spasms, heavy bleeding and consequently lead to abortion. If you suffer from Kidney problems, heart diseases or high blood pressure? Then avoid consuming large quantities of sassafras tea as it may interact with heart medication and because it is a blood thinner, it may be fatal even to adults. Although not for sale by Ancient Purity we should advise you in the wild to avoid the small white berries of the sassafras tree, as they may be toxic. Sassafras tree bark has been used in North America for centuries. According to an old Appalachian folk legend, those who carried sassafras bark in their pockets or drank sassafras root tea were protected against the evil eye, malevolence and envy. It was also used by the Cherokee people as a blood thinner to purify the blood, to treat skin diseases, rheumatism, among other ailments. In 1512, American Indians introduced the Spanish explorer Ponce de Leon to the bark and years later the same happened to pioneers, who settled on the continent. Whether or not this is true, looking back, we can trace the word “sassafras” as to probably deriving from the 16th-century Spanish term “saxifrage”. Interestingly, Sassafras was one of the first forest products to be exported from what are now the Mid-Atlantic states, in 1603, when England sent two vessels to the New World to bring back, among other things, cargoes of sassafras bark. Once introduced to the Europeans, they used Sassafras as a medicinal tonic in the 17th and 18th century to treat everything from rheumatism to gout. 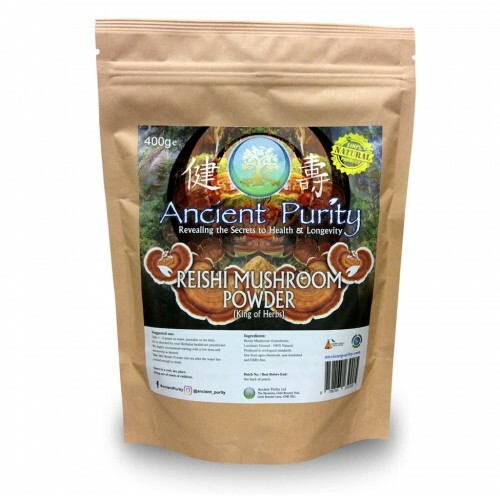 The marvels of this blood thinner helped to heal many ailments. Later in the 19th century, sassafras extract was used to flavour one of the first soft drinks in the US – root beer. However, in the 20th century, the use of safrole, the main constituent found in sassafras, became illegal despite its great reputation in the medical literature. This was due to a study performed on laboratory rats in the 1960s which confirmed that safrole is carcinogenic after the creatures developed liver cancer, once exposed to it. Consequently, safrole and sassafras not certified as safrole-free have been banned in the US as food additives or flavouring agents by the FDA and even the interstate shipment of sassafras trees for tea preparations were prohibited since 1976. Despite the ban on safrole, some people still enjoy sassafras herbal tea today, using it as a herbal remedy, a cooking additive to thicken soup and to season dishes, or even to create perfumes. Sassafras Root Bark - 100% Natural. Put 1 teaspoon of Sassafras Root Bark in boiling water, letting it steep for at least 20 minutes. Add Organic Maple Syrup, Honey perhaps some Lemon Juice to bring a more delicious flavour. NOTE: Consume ONLY 1 cup daily - DO NOT CONSUME FOR LONGER THAN 10 DAYS, Break for 2 weeks and repeat if desired. Or as directed by your Herbalist or healthcare practitioner. AVOID COMPLETELY IF YOU: Are Pregnant or Breast feeding, suffer from Kidney problems, heart diseases or high blood pressure. Storage: Store in a cool dry place, out of sunlight. Keep sealed and out of reach of Children.